Rhönite: Mineral information, data and localities. 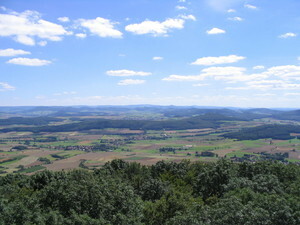 Named for the type locality in the Rhön Mountains, near Fulda, Hesse, Germany. A Ti3+-bearing member, one of three currently known phases with essential trivalent titanium by tistarite and grossmanite, is known from Allende meteorite ('UM1971-21-SiO:AlCaMgTi'). Hematite 5 photos of Rhönite associated with Hematite on mindat.org. Amphibole Supergroup 2 photos of Rhönite associated with Amphibole Supergroup on mindat.org. Pyroxene Group 1 photo of Rhönite associated with Pyroxene Group on mindat.org. Erionite 1 photo of Rhönite associated with Erionite on mindat.org. 9.DH.10 Ohmilite Sr3(Ti,Fe3+)(Si4O12)(O,OH) · 2-3H2O Mon. 9.DH.30 Krauskopfite BaSi2O5 · 3H2O Mon. 16.14.1 Zorite Na8(Ti,Nb)5(Si6O17)2(OH,O)5 · 14H2O Orth. 16.14.6 Jonesite Ba4(K,Na)2Ti4Al2(Si3O9)2(SiO4)4O2 · 6H2O Orth. 16.14.8 Labuntsovite-Mn Na4K4(Ba,K)2Mn2+(Ti,Nb)8(Si4O12)4(O,OH)8 · 10-12H2O Mon. 16.14.12 Eakerite Ca2SnAl2Si6O18(OH)2 · 2H2O Mon. 16.14.15 Maricopaite Pb7Ca2(Si,Al)48O100 · 32H2O Orth. Soellner, J. (1907) Über Rhönit, ein neues änigmatitähnliches Mineral und über das Vorkommen desselben in basaltischen Gesteinen. Neues Jahrbuch für Mineralogie und Geologie, Beilage: 24: 1-57. Lacroix, M.A. (1909) Not sur la rhönite du Puy de Barneire a Saint-Sandoux. Bulletin de la Société Française de Minéralogie et de Cristallographie: 32: 325-331. Tomita, T. (1934) On kaersutite from Dogo, Oki Islands, Japan, and its magmatic altration and resorption. Journal of the Shanghai Science Institute Section 2: 1: 99-136. Ramdohr, P. (1937) Erzmikroskopische untersuchungen an einigen seltenen oder bisher wenig beachteten erzmineralien, Teil 2. Zentralblatt für Mineralogie Abteilung A: 289-303. Yagi, K. (1953) Petrochemical studies on the alkalic rocks of the Morotu District, Sakhalin. Geological Society of America Bulletin: 64: 769-810. Ficke, B. (1961) Petrologische untersuchungen an tertiaren basaltischen bis phonolithischen vulkaniten der Rhön. Tschermaks Mineralogische und Petrographische Mitteilungen, Ser 3: 7: 337-436. Babkine, J.F., Conquere, F., Vilminot, J.C., Duong, P.K. (1964) Sur un nouveau gaisment de rhönite. Comptes Rendus de l'Académie des Sciences, Paris, Ser D: 258: 5479-5481. Cameron, K.L. (1970) Rhönite from Big Bend National Park, Texas. 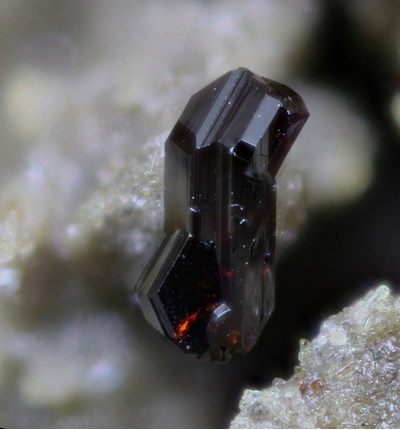 American Mineralogist: 55: 864-874. Stout, J.H., Johnston, A.D. (1985) Compositional variation of naturally occurring rhoenite. American Mineralogist: 70: 1211-1216. Bonaccorsi, E., Merlino, S., Pasero, M. (1990) Rhönite: structural and microstructural features, crystal chemistry and polysomatic relationships. European Journal of Mineralogy: 2: 203-218. Jambor, J.L., Puziewicz, J. (1991) New mineral names. American Mineralogist: 76: 665-671. Burt, D.M. (1994) Vector representation of some mineral compositions in the aenigmatite group, with special reference to hogtuvaite. The Canadian Mineralogist: 32: 449-457. Jensen, B.B. (1996) Solid solution among members of the aenigmatite group. Mineralogical Magazine: 60: 982-986. Kunzmann, T. (1999) The aenigmatite-rhönite mineral group. European Journal of Mineralogy: 11: 743-756. Grew, E.S., Hålenius, U., Pasero, M., Barbier, J. 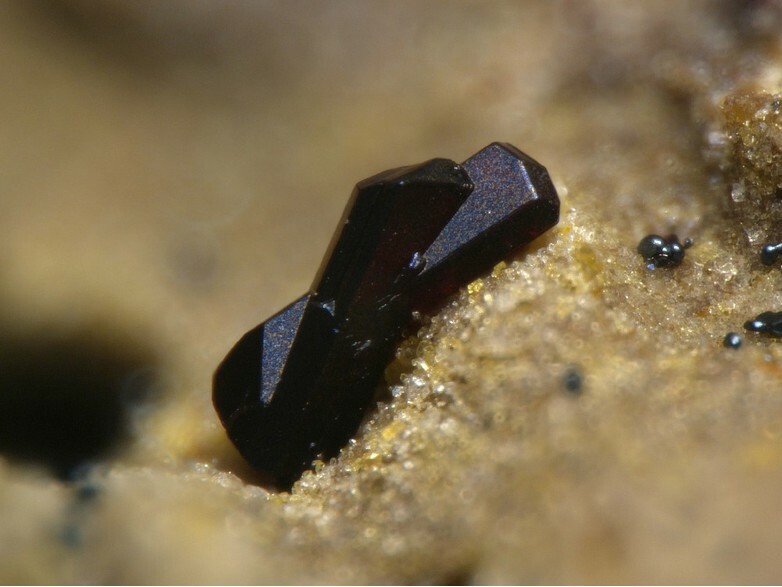 (2008) Recommended nomenclature for the sapphirine and surinamite group (sapphirine supergroup). Mineralogical Magazine: 72: 839-876. Treiman, A.H. (2008) Rhönite in Luna 24 pyroxenes: First find from the Moon, and implications for volatiles in planetary magmas. American Mineralogist: 93: 488-491. R.H. Grapes et al. , Mineralogical Magazine , August 2003, Vol. 67, N°4, pp. 639-651. Schebesta, K. (1983) Der Pauliberg - Eine Micromountfundstelle vor den Toren Wiens. Eisenblüte, 4 (10), 8-11.; R. Exel: Die Mineralien und Erzlagerstätten Österreichs (1993); U. Kolitsch, W. Postl, H.-P. Bojar and W. Trattner (2009): Die Mineralvorkommen im Basalt des Pauliberges. In: Autorenkollektiv (Red. M. A. Götzinger und P. Huber) (2009): Die Mineralien des Burgenlandes - Geologie, Mineralogie und mineralische Rohstoffe. – Wissenschaftliche Arbeiten aus dem Burgenland, Band 126, Amt der Burgenländischen Landesregierung, Abteilung 7 - Landesmuseum, Eisenstadt, 83-99. De Ignacio, C., Muñoz, M., & Sagredo, J. (2012). Carbonatites and associated nephelinites from Sao Vicente, Cape Verde Islands. Mineralogical magazine, 76(2), 311-355. Soellner, J. (1907): Über Rhönit, ein neues änigmatitähnliches Mineral und über das Vorkommen desselben in basaltischen Gesteinen, Neues Jahrbuch für Mineralogie und Geologie, Beilage, 24, 1-57. Lapis (1988) 7/8, 70-72.; Blaß, G. and Kruijen, F. (2015) Neuigkeiten aus der Vulkaneifel (II/2015). Mineralien-Welt, 26(5), 80-90. Hentschel, G., Seltene Minerale in Calcium-reichen Auswürflingen vom Bellerberg bei Mayen/Eifel, Aufschluß 29, 77-83, 1978; Lapis, 15 (5), 9-36; Shchipalkina, N.V., Pekov, I.V., Chukanov, N.V., Koshlyakova, N.N., Ternes, B. 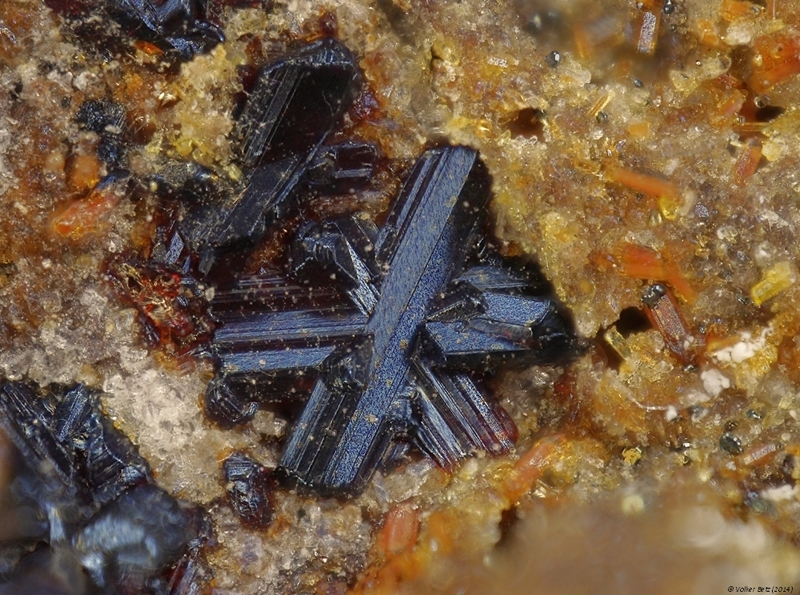 & Schüller, W. (2019): Crystal chemistry of dorrite from the Eifel volcanic region, Germany, and chemical variations in the khesinite-dorrite-rhönite-kuratite solid-solution system. Mineralogy and Petrology 113, 249-259. EGU / EGS - AGU - EUG Joint Assembly, Abstracts from the meeting held in Nice, France, 6 - 11 April 2003, abstract #748 "Silicate melt inclusions in olivine phenocrysts from Hegyestu (Bakony-Balaton Highland) and Pecsko alkaline basalts (Nograd-Gomor), Hungary"
Monkawa et al. (2002) Abstract of the Meeting of the Mineralogical Society of Japan, 65. American Mineralogist (1971): 56: 2053. Kyle, P.R., Price, R.C. (1975) Occurrences of Rhönite in Alkalic Lavas of the McMurdo Volccanic Group, Antarctica, and Dundedin Volcano, New Zealand. American Mineralogist, 60: 722-725. Mikouchi, T., McKay G., Koizumi E., Monkawa, A. & Miyamoto, M. (2003) Northwest Africa 1670: A new quenched angrite. Meteoritics & Planetary Science 38(7,Suppl. ): A115. Anan’ev, V. V., & Selyangin, O. B. (2011). Rhonite in molten inclusions from the olivine of allivalite nodules from Malyi Semyachik Volcano and basalts of Klyuchevskoi Volcano, Kamchatka. Journal of Volcanology and Seismology, 5(5), 335-340. Kopylova, M.G., Gurney, J.J., and Daniels, L.R.M. (1997): Contributions to Mineralogy and Petrology 129, 366-384.